On Saturday we decided to check out a new park that a fellow blogger told us about called "Rattray Marsh" in Mississauga, off of Lake Shore. Great walking trails with lots of "look out" spots. We forgot to take a picture of the Marsh, duh! Oh well, it's a good excuse to go back. I'm sure Rob will do a more detailed blog about our time there, but I just wanted to share a few pictures with you. Rob on one of the many walking trails through the woods and along the marsh. 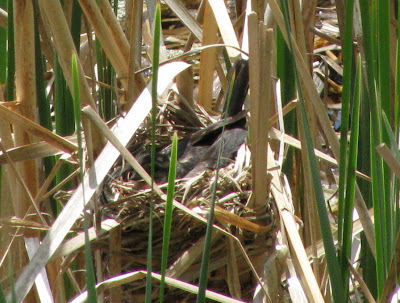 Female Red-Winged Blackbird sitting in her nest, probably on eggs. Hardest picture to take as the nest is out in the Marsh and very well camouflaged, I only found it because I watched her land in it. We think this is the silhouette of an Eastern Meadowlark, but with the angle of the sun, we couldn't really see him. Me at one of the "look out points" along the trail, the marsh is just to my right. Male Red-Winged blackbird looking down at us. Nice! One of my all-time favourite places to visit. :D Some days you will see deer, muskrat, etc. at this park. Looks like a nice walk. I'll have to go sometime. Looks like a wonderful park! Last night we were getting flowers from a lady from our church. She had a HUGE garden, and it made me think of you. It had lots of birdhouses, and birdbaths. It was like another world in her backyard. I enjoyed our time up at your place and being in your sanctuary.